Have you downloaded Drop yet? 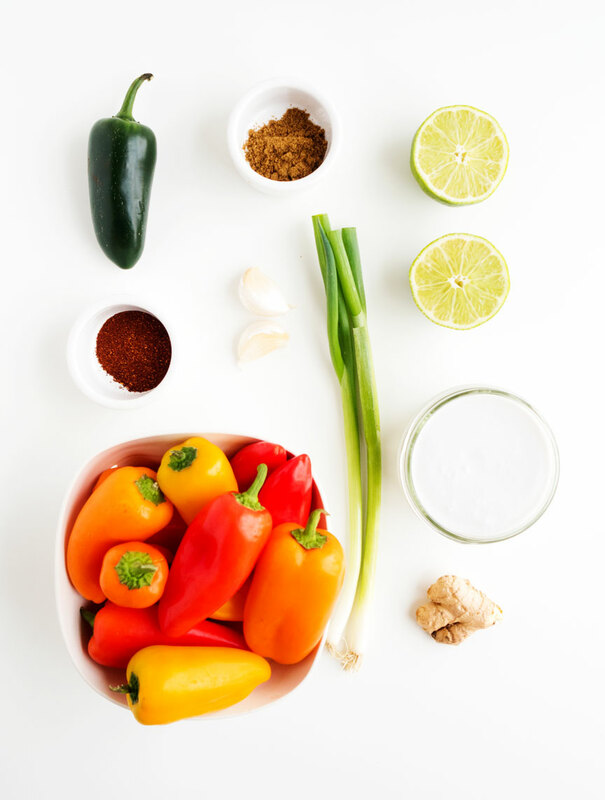 It’s a wonderful recipe app where you can find this recipe, and a bunch of others from me — some you haven’t seen before! Head to getDrop.com download it to check it out! We’re back in gardening business, folks! I hope. We’re trying, that’s for sure! Last year I applied to be on the waiting list for some community gardens around town, and earlier this spring we learned that we got a spot in one! YAY! The only issue? It was a pretty overrun and neglected spot. With both Marc and I being semi-neurotic and vv apt to overextending ourselves, we dove in head first to fix up our plot and make it gorgeous — serious weeding, deconstructing weird raised beds, installing cedar boundaries around the exterior, ammending the soil, etc. With all of that, plus having multiple jobs and outdoor adventures, we didn’t get plants in the ground very early — although some people say that’s fine, since it was so wet… I still feel behind! Anywho. We finally did get plants in the ground, and then lost them to slugs. UUGH. Lesson learned, slug-deterring-measures installed. Now, we’re hoping our newest round of babies makes it! The deer and squirrels might be another hurdle to cross (maybe a bunch of netting is our next project?? ), but my fingers are crossed that they’ll just leave our little planties alone! I can’t wait to actually SEE SOME VEGGIES on those greens! We planted all sorts of herbs, beets, carrots, brussels, kale, salad greens, cabbage, radishes, broccolini, tomatoes, peppers, squash, etc. Assuming all goes as planned, you’re gonna be seeing all the veg here on The Kitchen Paper and in person if you live anywhere near us! We’ve been running up (literally up. like straight up.) to the garden before work to water — at this point only 1-2 times per week, but when it’s hot mid-summer I think that’ll need to be more frequent — which is hard but a great way to get in some exercise and water the babies! How ’bout this chicken, eh? 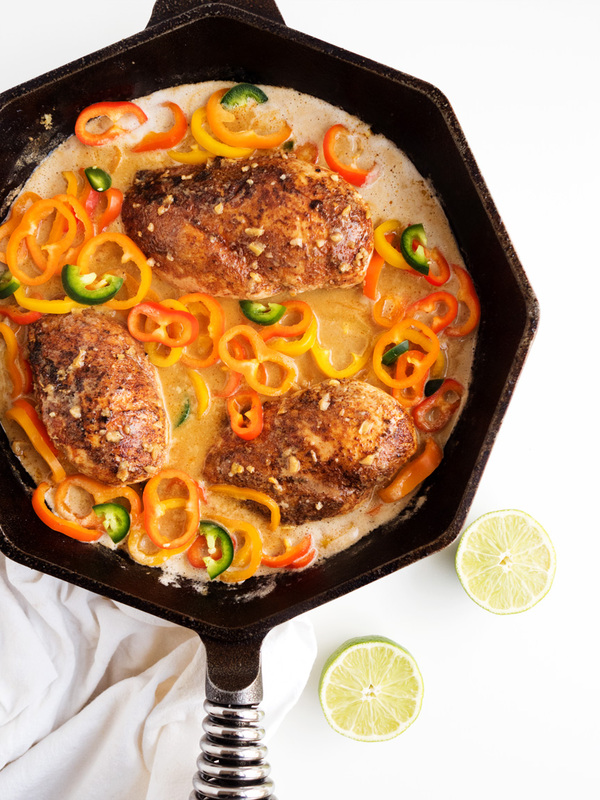 This is a super easy, whole30-approved, coconut-lime chicken with mini peppers. Really, you could use whatever veggies you have on hand. Just throw ’em in! Asparagus would be awesome in this recipe! 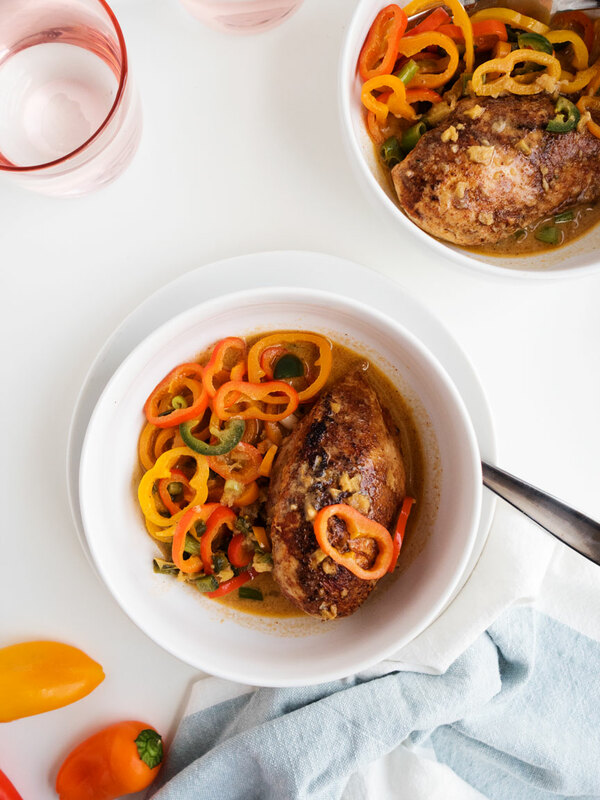 This fun chicken dish had coconut cream, lime, and sweet mini bell peppers. 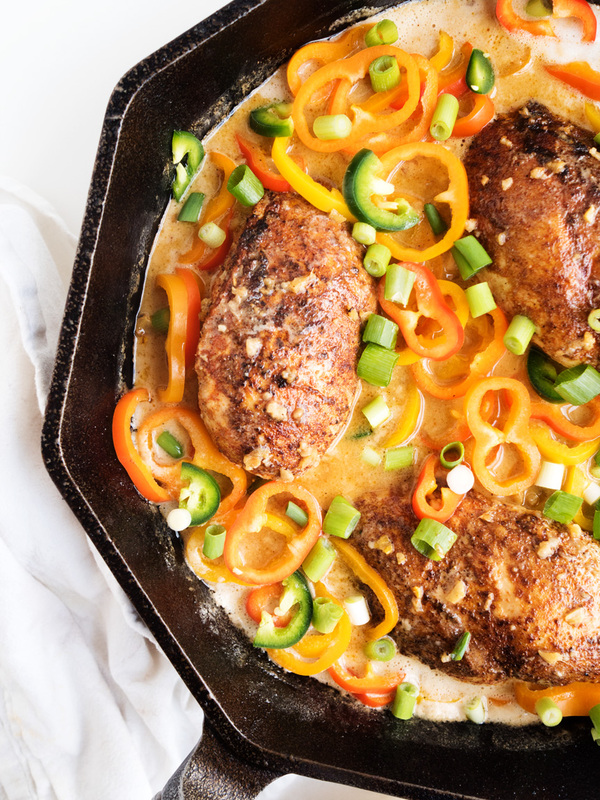 This dish cooks entirely on the stovetop, and comes together just thirty minutes. Combine the cumin, chili powder, salt, and pepper. Generously season the chicken breasts with the spice mixture on both sides. 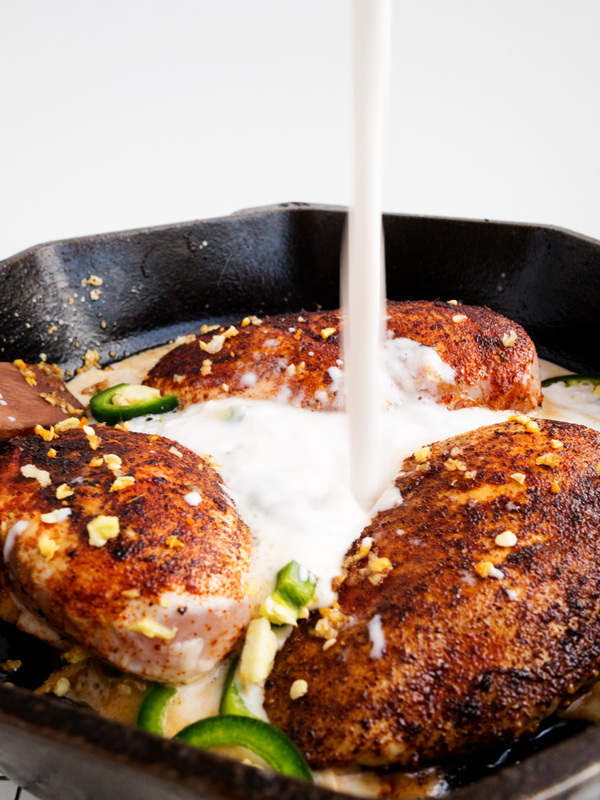 Heat a heavy skillet over medium-high heat, and add the chicken breasts in a single layer. Cook on the first side, without moving, for four minutes. After four minutes, turn the heat down to medium, flip the chicken breasts, add the oil and the garlic. Cook, stirring the garlic around the chicken breasts as best you can, for 1 minute before adding the peppers. After 2 minutes, add the ginger and coconut cream. Bring to a simmer and reduce the heat to low (or enough to maintain the simmer). Let simmer for 10 minutes. 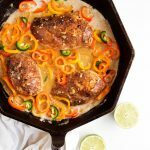 Depending on the thickness of your chicken breasts, you may need to continue to cook a bit longer. When the chicken is done (no longer pink on the inside), add the sliced jalapeños and remove from the heat. Squeeze the lime juice in, and add more salt to the coconut sauce if necessary. Garnish with green onions, and serve over rice. Hi Mary! 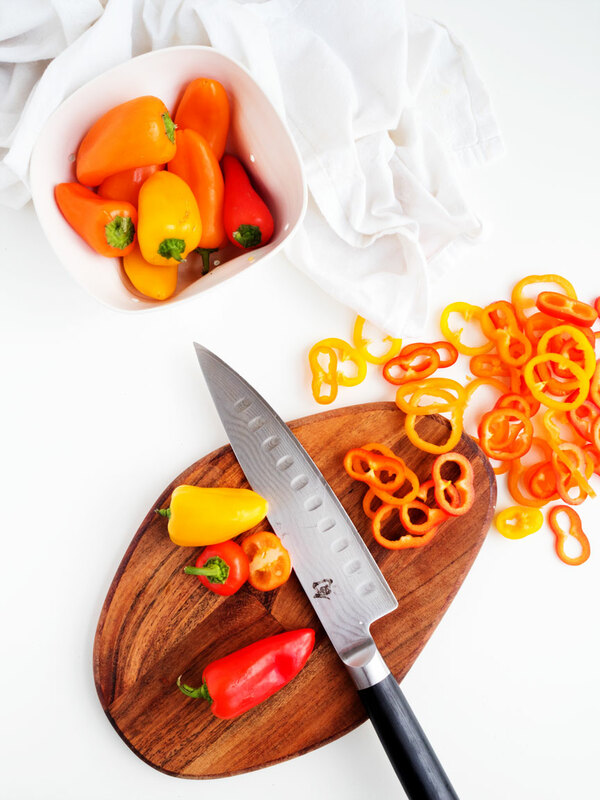 How much lime and jalapeño do you use? I assume one and one, but it isn’t listed in the ingredients. Hope you’re doing well! A healthy dish with lots of yum filled in it. I am gonna try this out today and eat it up all. Lovely dish you have prepared and inspired me also to go for it. I have a can of coconut milk; would that be an ok substitute for the coconut cream? Also, I don’t have any limes on hand; do you think this would be good with lemon? Your recipe sounds fantastic.